The Secret In The Cliffs by Kristin Tucker is a contemporary YA adventure that is entertaining and gripping from the start. I was drawn in immediately, engaged and questioning the action. The novel is an exploration both literally and figuratively. Teenagers explore caves as well as exploring where they have been and where they are going. The important thing at that age is to never lose face. The caves are exciting as bits from the past are unearthed. Mysterious men who seem to be after the teens all add to the suspense. The action is gripping and exciting. Comprehensive descriptions enable the reader to ‘feel’ the teenagers’ fears. 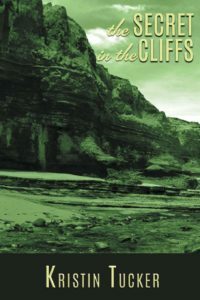 The Secret In The Cliffs is a perfect read for ages twelve to adult, with Kristin Tuckers ability to weave a tale, it deserves to be up there with the best sellers. For me, I found Kristin Tucker’s style reminiscent of the old Enid Blyton adventure stories that I read as a teen. She certainly has the ability to be the new name in YA fiction.